When I first embarked on my gardening journey approx. 12 years ago, I don't think at the time I had any idea what I was getting into. As a little girl growing up on a small farm we had a greenhouse. My parents would sow seeds every year, both annuals and perennials. Of course, the timing had to be right so we could sell the plants in the spring to the community. I remember spending the summers either watering, weeding or deadheading the plants. Back then I didn't realize just how much my parents were teaching me about gardening. We even had our own beehive for which honey would be extracted and sold. When my husband and I moved into our home the newly acquired property did not have any gardens. Shortly thereafter we discovered our soil to be that of shale and rock. I can't even tell you how many truck loads of topsoil were brought in to create what we have today. I jumped in with both feet and thought to myself "Whatever I have learned will come back to me." Each year my husband and I added another garden. Whether it was a large flower bed or a simple circle around a bird feeder it was another place to experiment with plants. As the design and layout of the gardens evolved so did my knowledge of new hybrid plants. Unfortunately, both my parents passed away years ago and I still think to myself if only they could see what I have done. I think they would be proud, especially my mother who loved to admire the blooms. Several years ago I went with a friend to the local nursery and as we strolled by the tables of perennials he said to me "What kind of plant is this?" I would take one look at the leaf form or the bloom and rattle off the plant name. He would check the plastic tag in the pot to see if I was right. After playing this game for a few minutes he finally said to me "I guess you know your plants." I replied "Thank you, my parents taught me well." As I write this today is the anniversary of my mother's passing. If only I had more time with her ... to show her the flower gardens ... if only I had a chance to say goodbye. I truly believe she is looking down upon me enjoying the gardens. Maybe she would even sit and have a cup of tea with me! 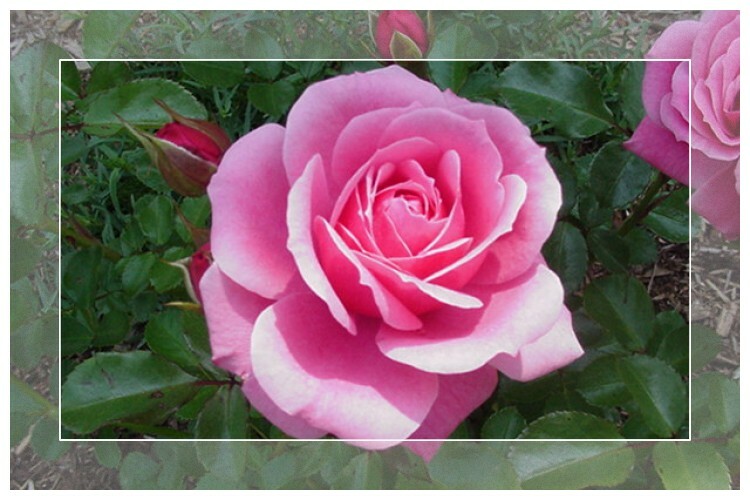 A pink rose from my garden for her. What a wonderful tribute to your parents! Thanks for sharing this post. I lost my Dad this past December. He and Mom loved to garden. It is one of my fondest memories of Dad. I don't know if I inherited his green thumb but I have a real appreciation for gardens-both vegetable and flower gardens! Oh sweetie!! I've literally got tears in my eyes! What an amazing tribute to your mom and what a wonderful, thankful daughter you are!! What a wonderful tribute to your mother. And what a wonderful mother to instill the wonders of nature in you. You live the tribute to your parents. What a wonderful tribute. Even though your parents are no longer with you, I'm sure they're watching and enjoying your beautiful gardens. I have to tell you that my mother was over Monday night and I introduced her to your blog. She loved looking at all your beautiful posts. She too spends many hours in her flower beds. Each year it gets bigger and better. A beautiful and touching post, Donna! I know how hard it is to be without our parents! You are correct, your parents would be so proud of you! I am so blessed to be able to have my mom living with us. Your words about your mother remind me to enjoy this special time. Thanks, Donna. I know your mom would appreciate you blog and all you have done. What a wonderful way to honor your parents! I love all your beautiful photos of your flowers! That is a gorgeous rose. What a great tribute to your parents! Beautiful post and tribute. I always enjoy the pictures of your garden that you share with us. You've done your parents proud.